A warm welcome to all of those just discovering Raven’s Wand! Readers frequently tell me how much they adore thunder-sprites, and so I thought I’d post a series of short articles about these wild but popular creatures. Tonight we look at Silver-fist, Names, and Birth-signs. More to follow – enjoy! Thunder-sprites, like the elemental forces that give birth to them, are virtually immortal; being born as a lightning-bolt and then returning to the skies when their time here is over, to be reborn as another bolt in another place and time. Silver-fist is their Lord, and he was born from the very first lightning that struck the Earth (or The Blue Orb as sprites and witches know it) epochs ago when the world was a seething, primordial mass. Thunder-sprites have the utmost respect for their Lord, who is both brave and just. As The Dark Raven Chronicles continues to expand, Silver-fist makes appearances in many of the legends thunder-sprites tell of their home in the skies, and you’ll also see how his wisdom is crucial to helping witches here on Earth, along with his greatest general, who lives in a coven alongside a witch but keeps his identity a secret. Sprites, as most readers will know by now, take their names from whatever devastation was wrought by the storm that birthed them, and not always the individual bolt that carried the sprite to earth. Annie Barden, one of Wildwood’s young witches, has a sprite called ‘June’, much to the amusement of his fellow sprites. His full name is ‘Snows-in-June’, named after a huge summer storm dumped three inches of hail on the high fells, resembling snow. Annie elected to name him ‘June’, although ‘Snowy’ might have been a better choice! Sand-Fired-To-Glass (or just Glass) is another good example, named for a lightning strike that left a beach with a dendrite of melted sand, turned to glass by the incredible heat. Sprites love the complex names used to honour their storms, as well as their shortened version (apart from June perhaps), but they also have special storm names that only other sprites know, and they never reveal them to humans, not even their witches. Every sprite’s name tells a story, and one notable one is Jump-the-Cross, named for a lightning-bolt that hit a church spire, rebounded and struck a tree in the churchyard below. Most of us know our zodiac sign even if we’re skeptical about the future being written in the stars. Thunder-sprites have their own birth-signs, but based on trees and seasons. First comes the tree, then comes the time of year, but sprites have different names for the seasons than we do; winter is ‘sleep’, spring is ‘rise’, summer is ‘charge’ and autumn is ‘weep’. Skald was born in an ash tree in the spring time, and so his birth-sign is ‘rising-ash’. 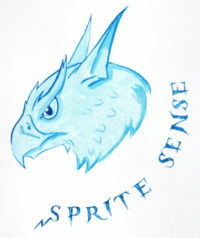 But there’s an added twist – sprites add the moon phase to their birth-sign, and again these are known differently. Waxing is ‘singing’, wanning is ‘falling’, while a full moon is known as a ‘glory’ and a new moon is called a ‘lost’. Hence, Skald’s full birth-sign is ‘rising-ash of the singing-moon’. Gale, Kolfinnia’s sprite, has a birth-sign of ‘weeping-ash of the falling-moon.’ A sprite born in summer, in an oak tree and on a full moon would be born under the sign; ‘charging-oak of the glory-moon’. Simple! I’ll leave you to work out the birth particulars of a sprite with the sign; ‘sleeping-yew of the lost-moon’ . . . good luck! This entry was posted in Wildwood - Writing on March 23, 2017 by Steve Hutton.